I was able to assist one with a special request for a special event. They needed a few pair of our famous Whizard Stainless Steel Metal Mesh gloves but they needed them the next day. Unfortunately, we were out of stock on the size they needed but fortunately, my reliable colleague at Wells Lamont Industrial, Pat, came through at the very end of their work day and had them shipped overnight for us. He saved the day and the show. What’s interesting is the various types of customers that use our gloves. This one is Caviar & Caviar in Fort Lauderdale, Florida. They are a gourmet purveyor of caviar and salmon products. They also feature a web site for on-line orders. Check them out. 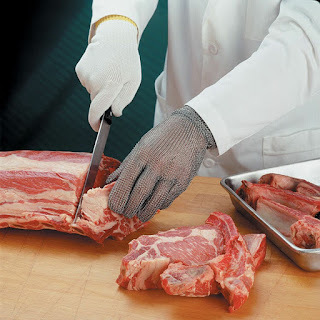 I’m not surprised that Caviar & Caviar deal in delicacies and use the SS Metal Mesh gloves – these gloves are the ultimate delicacy in cut resistance in food processing.